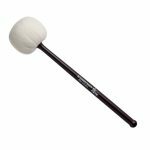 Vic Firth Soundpower BD8 Grandioso Bass Drum Mallets feature a head of extraordinary weight with contoured shaft to fully activate the fundamental of the bass drum. The musical term Grandioso means to play “in a grand‚ imposing and noble style”. The BD8 Grandioso creates a round‚ warm sound when played at lower dynamics, and when needed will produce the ultimate fortissimo! 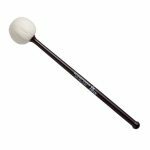 Great for drum corps‚ marching band‚ indoor marching and concert playing. 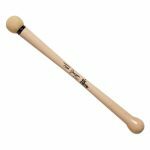 Length=17.00" Head=3.375"
The Tom Gauger TG26 Double End Bass Drum Mallet is designed for one handed rolls. Made by Vic Firth. 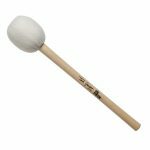 Length=15.5" Head=2.75" Tom Gauger developed his line of mallets during his 35+ year career with the Boston Symphony and Boston Pops Orchestras and as an educator at Boston University and the Boston University Tanglewood Institute. Each product was developed on the job and for the job, designed to solve a technical problem or achieve a desired sound. Vic Firth Soundpower BD1 General Bass Drum Mallets feature turned maple handles and yarn wound mallet heads. General hardness--perfect for all-purpose playing. Length=17.00" Head=3.25"
The Tom Gauger TG08 Staccato Bass Drum-Gong Beater features a medium head for a full but articulate sound. Made by Vic Firth. Length=16.188" Head=2.75" Tom Gauger developed his line of mallets during his 35+ year career with the Boston Symphony and Boston Pops Orchestras and as an educator at Boston University and the Boston University Tanglewood Institute. Each product was developed on the job and for the job, designed to solve a technical problem or achieve a desired sound. The Tom Gauger TG07 Ultra Staccato Bass Drum Mallet features a wood core and chamois cover for maximum clarity. Made by Vic Firth. 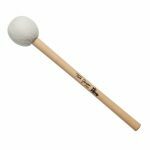 Length=16.125" Head=2.344" Tom Gauger developed his line of mallets during his 35+ year career with the Boston Symphony and Boston Pops Orchestras and as an educator at Boston University and the Boston University Tanglewood Institute. Each product was developed on the job and for the job, designed to solve a technical problem or achieve a desired sound. The Tom Gauger TG01 General Bass Drum Mallet is perfect for all purpose playing. Articulate, but not too hard. Made by Vic Firth. 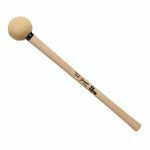 Length=16.188" Head=2.75" Tom Gauger developed his line of mallets during his 35+ year career with the Boston Symphony and Boston Pops Orchestras and as an educator at Boston University and the Boston University Tanglewood Institute. Each product was developed on the job and for the job, designed to solve a technical problem or achieve a desired sound. 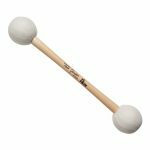 Vic Firth Soundpower BD2 Legato Bass Drum Mallets are softer‚ for dark sounds, and feature seamless, round felt heads with tapered maple handles for a deep, dark sound without excessive weight Length=17.5" Head=3.375"
Vic Firth Soundpower BD3 Staccatto Bass Drum Mallets are harder‚ for rhythmic clarity, and feature seamless, round felt heads with tapered maple handles for a deep, dark sound without excessive weight. 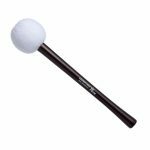 Length=16.5" Head=2.75"
Vic Firth Soundpower BD7 Rolling Bass Drum Mallets are general hardness mallets for two-fisted bass drum rolls. 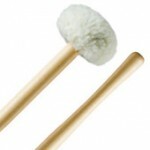 They feature seamless, round felt heads with tapered maple handles for a deep, dark sound without excessive weight. General hardness--the same hardness as the BD1. Sold in pairs. Length=16.00" Head=2.75"